This article is taken from a press release titled Pathogenesis of Gout. The text is very scientific, and even an included glossary does not prevent some difficult to understand passages. The study has a very wide scope, and I will rewrite various parts of it in future articles to clarify some of the key points. Posted on: Saturday, 8 October 2005, 03:01 CDT via science news release. The overall disease burden of gout is substantial and may be increasing. As more scientific data on the modifiable risk factors and comorbidities of gout become available, integration of these data into gout care strategies may become essential. Hyperuricemia and gout are associated with the insulin resistance syndrome and related comorbid conditions. Lifestyle modifications that are recommended for gout generally align with those for major chronic disorders (such as the insulin resistance syndrome, hypertension, and cardiovascular disorders); thus, these measures may be doubly beneficial for many patients with gout and particularly for individuals with these comorbid conditions. Effective management of risk factors for gout and careful selection of certain therapies for comorbid conditions (such as hypertension or the insulin resistance syndrome) may also aid gout care. The urate-anion exchanger URAT1 (urate transporter-1) is a specific target of action for both antiuricosuric and uricosuric agents. The long-term health effect of hyperuricemia (beyond the increased risk for gout) needs to be clarified, including any potential consequences associated with the chronic hyperuricemia that anti-inflammatory treatment does not correct. A direct causal relationship exists between serum urate levels and the risk for gout. Lifestyle factors, including adiposity and dietary habits, appear to contribute to serum uric acid levels and the risk for gout. Urate is extensively reabsorbed from the glomerular ultrafiltrate in the proximal tubule via the brush-border urate-anion exchanger URAT1. Sodium-dependent reabsorption of anions increases their concentration in proximal tubule cells, resulting in increased urate exchange via URAT1, increased urate reabsorption by the kidney, and hyperuricemia. Genetic variation in renal urate transporters or upstream regulatory factors may explain the hereditary susceptibility to conditions associated with high urate levels and a patient’s particular response to medications; these transporters may also serve as targets for future drug development. Urate crystals are able to directly initiate, to amplify, and to sustain an intense inflammatory attack because of their ability to stimulate the synthesis and release of humoral and cellular inflammatory mediators. Cytokines, chemokines, proteases, and oxidants involved in acute urate crystal-induced inflammation also contribute to the chronic inflammation that leads to chronic gouty synovitis, cartilage loss, and bone erosion. Gout is a type of inflammatory arthritis that is triggered by the crystallization of uric acid within the joints and is often associated with hyperuricemia (Figure 1). Acute gout is typically intermittent, constituting one of the most painful conditions experienced by humans. Chronic tophaceous gout usually develops after years of acute intermittent gout, although tophi occasionally can be part of the initial presentation. In addition to the morbidity that is attributable to gout itself, the disease is associated with such conditions as the insulin resistance syndrome, hypertension, nephropathy, and disorders associated with increased cell turnover (1, 2). A condensation product of adenine and D-ribose; a nucleoside found among the hydrolysis products of all nucleic acids and of the various adenine nucleotides. A phosphorylated nucleoside C10H16N5O13P3 of adenine that supplies energy for many biochemical cellular processes by undergoing enzymatic hydrolysis (especially to adenosine diphosphate). A transport protein that mediates movement of an anion across the plasma membrane by exchanging it with another anion on the opposite side of the membrane. Urate–anion exchange plays a key role in the transport of urate across cell membranes. A chemical or drug that results in reduced renal excretion of urate and hyperuricemia; pyrazinamide, the classic antiuricosuric drug, exerts its effect by promoting proximal tubular reabsorption of urate. The protein component of any lipoprotein complexes that is a normal constituent of plasma chylomicrons, high-density lipoproteins, low-density lipoproteins, and very low-density lipoproteins in humans. Disintegration of cells into membrane-bound particles that are then phagocytosed by other cells. Purified from superficial renal cortex, BBMV are predominantly derived from the renal proximal tubule; urate transporter-1 was initially defined as an anion exchanger activity present in renal BBMV preparations. Chemotactic factor that stimulates neutrophil adhesion and migration by activating the β2-integrin CD11b/CD18. A class of polypeptide cytokines, usually 8–10 kDa, that are chemokinetic and chemotactic, stimulating leukocyte movement and attraction. Competitive inhibition of urate exchange by a urate transporter-1 substrate present at the same side of the plasma membrane. A mucopolysaccharide occurring in sulfated form; present among the ground substance materials in the extracellular matrix of connective tissue (for example, cartilage). Downstream kinase activated by ERK-1/ERRK-2 and p38 cascades, leading to autophosphorylation and regulation of complex biological responses. An enzyme that makes the prostaglandins that cause inflammation, pain, and fever; nonsteroidal anti-inflammatory drugs relieve symptoms as result of their ability to block COX-2 enzymes. Intercellular messenger proteins; hormone-like products of many different cell types that are usually active within a small radius of the cells producing them. All-cis-4,7,10,13,16,19-docosahexaenoic acid, an ω-3, polyunsaturated, 22-carbon fatty acid found almost exclusively in fish and marine animal oils; a substrate for cyclooxygenase. All-cis-5,8,11,14,17-eicosapentaenoic acid, an ω-3, polyunsaturated, 20-carbon fatty acid found almost exclusively in fish and marine animal oils; a substrate for cyclooxygenase. Endothelial cell adhesion molecules consisting of a lectin-like domain, an epidermal growth factor–like domain, and a variable number of domains that encode proteins homologous to complement binding proteins; their function is to mediate the binding of leukocytes to the vascular endothelium. A recessive genetic disorder caused by homozygous loss-of-function mutations in the SLC22A12 gene encoding urate transporter-1. Patients with this disorder have hypouricemia that does not respond to uricosuric or antiuricosuric agents. A family of similar heterotrimeric proteins found in the intracellular portion of the plasma membrane; bind activated receptor complexes and, through conformational changes and cyclic binding and hydrolysis of guanosine triphosphate, directly or indirectly effect alterations in channel gating and couple cell surface receptors to intracellular responses. A large family of hormone-like messenger proteins produced by immune cells that act on leukocytes and other cells. An enzyme catalyzing the conversion of a proenzyme to an active enzyme (for example, enteropeptidase [enterokinase]) or catalyzing the transfer of phosphate groups. One of a number of widely differing substances having pronounced and dramatic physiologic effects; kallidin and bradykinin are polypeptides, formed in blood by proteolysis secondary to some pathologic process producing vasodilation. A helical protein secreted by adipose tissue; acts on a receptor site in the ventromedial nucleus of the hypothalamus to curb appetite and increase energy expenditure as body fat stores increase. Substance produced from arachidonic acid by the lipoxygenase pathway; functions as a regulator of allergic and inflammatory reactions; stimulates the movement of leukocytes; identified by the letters A, B, C, D, and E, with subscripts indicating the number of double bonds in the molecule (for example, LTB4). Any of several conjugated tetraene derivatives of arachidonic acid that oppose the actions of leukotrienes, have potent vasodilating effects, and appear to be toxic to natural killer cells. A family of protein-hydrolyzing endopeptidases that hydrolyze extracellular proteins, especially collagens and elastin. One of the mitogen-activated protein kinases that signals transduction pathways in eukaryotic cells and integrates diverse extracellular signals; regulates complex biological responses, such as growth, differentiation, and death. An anion transporter capable of adenosine triphosphate–driven urate efflux, expressed at the apical membrane of the proximal tubule. Nucleotide: A combination of a nucleic acid (purine or pyrimidine), 1 sugar (ribose or deoxyribose), and a phosphoric group. A basolateral anion exchanger involved in proximal tubular transport of multiple organic anions, including urate; OAT1 is encoded by the SLC22A6 gene. A basolateral anion exchanger involved in proximal tubular transport of multiple organic anions, including urate; OAT3 is encoded by the SLC22A8 gene. Polyunsaturated fatty acids that have the final double bond in the hydrocarbon chain between the third and fourth carbon atoms from 1 end of the molecule; found especially in fish, fish oils, vegetable oils, and green leafy vegetables. A vitamin K–dependent, calcium-binding bone protein, the most abundant noncollagen protein in bone; increased serum concentrations are a marker of increased bone turnover in disease states. One of the mitogen-activated protein kinases that signals transduction pathways in eukaryotic cells and integrates diverse extracellular signals; regulates complex biological responses such as growth, differentiation, and death. A nuclear receptor regulating an array of diverse functions in a variety of cell types, including regulation of genes associated with growth and differentiation. An enzyme that catalyzes the hydrolysis of a phospholipid. Any of a class of physiologically active substances present in many tissues; causes vasodilation, vasoconstriction, and antagonism to hormones that influence lipid metabolism. Any of a class of glycoproteins of high molecular weight that are found especially in the extracellular matrix of connective tissue. The earliest segment of the renal tubule, responsible for the reabsorption of urate and other solutes from the glomerular ultrafiltrate. A double-ringed, crystalline organic base, C5H4N, from which the nitrogen bases adenine and guanine are derived; uric acid is a metabolic end product. The “Solute Carrier-22” gene family encompasses more than 20 different genes encoding organic anion and cation transporters, including the urate transporter-1 (URAT1, SLC22A12), organic anion transporter-1 (OAT1, SLC22A6), and organic anion transporter-3 (OAT3, SLC22A8). A member of the SLC5 gene family of sodium-coupled transporters; a leading candidate for the sodium-dependent lactate/butyrate/pyrazinoate/nicotinate transporter that collaborates with urate transporter-1 in proximal tubular reabsorption of urate. One of a group of enzymes of the transferase class that catalyze the phosphorylation of tyrosine residues in specific membrane vesicle–associated proteins. Trinucleotide sequence (UAA, UGA, or UAG) that specifies the end of translation or transcription. Inflammation of a synovial membrane, especially that of a joint; in general, when unqualified, the same as arthritis. Transfer of genetic code information from one kind of nucleic acid to another; commonly used to refer to transfer of genetic information from DNA to RNA. A regulatory cytokine that has multifunctional properties and can enhance or inhibit many cellular functions, including interfering with the production of other cytokines and enhancing collagen deposition. Stimulation of urate exchange by a urate transporter-1 substrate when present at the opposite side of the plasma membrane; antiuricosuria apparently results from trans-stimulation of urate reabsorption by anions within the cytoplasm of proximal tubular epithelial cells. A polypeptide cytokine, produced by endotoxin-activated macrophages, that has the ability to modulate adipocyte metabolism, lyse tumor cells in vitro, and induce hemorrhagic necrosis of certain transplantable tumors in vivo. The urate–anion exchanger expressed at the apical brush-border membrane of proximal tubular epithelial cells; URAT1 is encoded by the SLC22A12 gene. Also known as galectin-9; may also be involved in proximal tubular urate secretion. A chemical or drug that results in increased renal excretion of urate; urate transporter-1 appears to be the major target for uricosuric drugs. A voltage-sensitive organic anion transporter capable of transporting urate and expressed at the apical membrane of the proximal tubule. The overall disease burden of gout remains substantial and may be increasing. The prevalence of self-reported, physician-diagnosed gout in the Third National Health and Nutrition Examination Survey was found to be greater than 2% in men older than 30 years of age and in women older than 50 years of age (3). The prevalence increased with increasing age and reached 9% in men and 6% in women older than 80 years of age (4). Furthermore, the incidence of primary gout (that is, patients without diuretic exposure) doubled over the past 20 years, according to the Rochester Epidemiology Project (4). Dietary and lifestyle trends and the increasing prevalence of obesity and the metabolic syndrome may explain the increasing incidence of gout. Researchers have recently made great advances in defining the pathogenesis of gout, including elucidating its risk factors and tracing the molecular mechanisms of renal urate transport and crystal-induced inflammation. This article reviews key aspects of the pathogenesis of gout with a focus on the recent advances. Humans are the only mammals in whom gout is known to develop spontaneously, probably because hyperuricemia only commonly develops in humans (5). In most fish, amphibians, and nonprimate mammals, uric acid that has been generated from purine (see Glossary) metabolism undergoes oxidative degradation through the uricase enzyme, producing the more soluble compound allantoin. In humans, the uricase gene is crippled by 2 mutations that introduce premature stop codons (see Glossary) (6). The absence of uricase, combined with extensive reabsorption of filtered urate, results in urate levels in human plasma that are approximately 10 times those of most other mammals (30 to 59 μmol/L) (7). The evolutionary advantage of these findings is unclear, but urate may serve as a primary antioxidant in human blood because it can remove singlet oxygen and radicals as effectively as vitamin C (8). Of note, levels of plasma uric acid (about 300 M) are approximately 6 times those of vitamin C in humans (8, 9). Other potential advantages of the relative hyperuricemia in primate species have been speculated (8, 10, 11). However, hyperuricemia can be detrimental in humans, as demonstrated by its proven pathogenetic roles in gout and nephrolithiasis and by its putative roles in hypertension and other cardiovascular disorders (12). Uric acid is a weak acid (pKa, 5.8) that exists largely as urate, the ionized form, at physiologic pH. As urate concentration increases in physiologic fluids, the risk for supersaturation and crystal formation generally increases. Population studies indicate a direct positive association between serum urate levels and a future risk for gout (13, 14), as shown in Figure 2. Conversely, the use of antihyperuricemic medication is associated with an 80% reduced risk for recurrent gout, confirming the direct causal relationship between serum uric acid levels and risk for gouty arthritis (15). The solubility of urate in joint fluids, however, is influenced by other factors in the joint, as shown in Figure 3. Such factors include temperature, pH, concentration of cations, level of articular dehydration, and the presence of such nucleating agents as nonaggregated proteoglycans, insoluble collagens, and chondroitin sulfate (see Glossary) (16-18). Variation in these factors may account for some of the difference in the risk for gout associated with a given elevation in serum urate level (13, 14). Furthermore, these factors may explain the predilection of gout in the first metatarsal phalangeal joint (a peripheral joint with a lower temperature) and osteoarthritic joints (18) (degenerative joints with nucleating debris) and the nocturnal onset of pain (because of intra-articular dehydration) (19). The amount of urate in the body depends on the balance between dietary intake, synthesis, and the rate of excretion (20), as shown in Figure 1. Hyperuricemia results from urate overproduction (10%), underexcretion (90%), or often a combination of the two. The purine precursors come from exogenous (dietary) sources or endogenous metabolism (synthesis and cell turnover). Figure 1. Overview of the pathogenesis of gout. Gout is mediated by the supersaturation and crystallization of uric acid within the joints. The amount of urate in the body depends on the balance between dietary intake, synthesis, and excretion. Hyperuricemia results from the overproduction of urate (10%), from underexcretion of urate (90%), or often a combination of the two. Approximately one third of urate elimination in humans occurs in the gastrointestinal tract, with the remainder excreted in the urine. The dietary intake of purines contributes substantially to the blood uric acid. For example, the institution of an entirely purine-free diet over a period of days can reduce blood uric acid levels of healthy men from an average of 297 μmol/L to 178 μmol/L (21, 22). The bioavailable purine content of particular foods would depend on their relative cellularity and the transcriptional (see Glossary) and metabolic activity of the cellular content (20). Little is known, however, about the precise identity and quantity of individual purines in most foods, especially when cooked or processed (23). When a purine precursor is ingested, pancreatic nucleases break its nucleic acids into nucleotides (see Glossary), phosphodiesterases break oligonucleotides into simple nucleotides, and pancreatic and mucosal enzymes remove phosphates and sugars from nucleotides (20). The addition of dietary purines to purine-free dietary protocols has revealed a variable increase in blood uric acid levels, depending on the formulation and dose of purines administered (21). For example, RNA has a greater effect than an equivalent amount of DNA (24), ribomononucleotides have a greater effect than nucleic acid (21), and adenine has a greater effect than guanine (25, 26). I have moved the section about Harvard Healthy Eating Pyramid to Gout Food Pyramids for GoutPal Dieters, including Figure 4. Figure 2. The relationship between serum uric acid levels and the incidence of gout. Annual incidence of gout was less than 0.1% for men with serum uric acid levels less than 416 μmol/L, 0.4% for men with levels of 416 to 475 μmol/L, 0.8% for men with levels of 476 to 534 μmol/L, 4.3% for men with levels of 535 to 594 μmol/L, and 7.0% for men with levels greater than 595 μmol/L, according to the Normative Aging Study (13). The solid line denotes these data points; the dotted line shows an exponential projection of the data points. The steps in the urate production pathways implicated in the pathogenesis of gout are displayed in Figure 5. The vast majority of patients with endogenous overproduction of urate have the condition as a result of salvaged purines arising from increased cell turnover in proliferative and inflammatory disorders (for example, hematologic cancer and psoriasis), from pharmacologic intervention resulting in increased urate production (such as chemotherapy), or from tissue hypoxia. Only a small proportion of those with urate overproduction (10%) have the well-characterized inborn errors of metabolism (for example, superactivity of 5′-phosphoribosyl-1-pyrophosphate synthetase and deficiency of hypoxanthine-guanine phosphoribosyl transferase). These genetic disorders have been extensively reviewed in textbooks (20, 33, 34), and the involved pathways are depicted in Figure 5. Figure 3. Mechanisms of monosodium urate crystal formation and induction of crystal-induced inflammation. Urate crystallizes as a monosodium salt in oversaturated tissue fluids. Its crystallization depends on the concentrations of both urate and cation levels. Several other factors contribute to the decreased solubility of sodium urate and crystallization. Alteration in the extracellular matrix leading to an increase in nonaggregated proteoglycans, chondroitin sulfate, insoluble collagen fibrils, and other molecules in the affected joint may serve as nucleating agents. Furthermore, monosodium urate (MSU) crystals can undergo spontaneous dissolution depending on their physiochemical environments. Chronic cumulative urate crystal formation in tissue fluids leads to MSU crystal deposition (tophus) in the synovium and cell surface layer of cartilage. Synovial tophi are usually walled off, but changes in the size and packing of the crystal from microtrauma or from changes in uric acid levels may loosen them from the organic matrix. This activity leads to "crystal shedding" and facilitates crystal interaction with synovial cell lining and residential inflammatory cells, leading to an acute gouty flare. Conditions associated with net adenosine triphosphate (ATP) (see Glossary) degradation lead to accumulation of adenosine diphosphate (ADP) and adenosine monophosphate (AMP), which can be rapidly degraded to uric acid (35-44), as shown in Figure 5. For example, ethanol administration has been shown to increase uric acid production by net ATP degradation to AMP (41, 44). In addition, decreased urinary excretion as a result of dehydration and metabolic acidosis may contribute to the hyperuricemia that is associated with ethanol ingestion, as discussed later in this review (34, 45). Recently, a large-scale prospective study confirmed that the effect of ethanol on urate levels can be translated into the risk for gout (31). 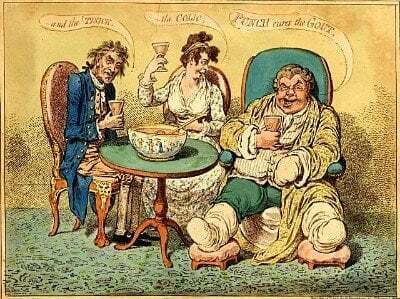 Compared with abstinence, daily alcohol consumption of 10 to 14.9 g increased the risk for gout by 32%; daily consumption of 15 to 29.9 g, 30 to 49.9 g, and 50 g or greater increased the risk by 49%, 96%, and 153%, respectively. Furthermore, the study also found that this risk varied according to type of alcoholic beverage: Beer conferred a larger risk than liquor, whereas moderate wine drinking did not increase risk (31). Correspondingly, a national U.S. survey demonstrated parallel associations between these alcoholic beverages and serum urate levels (46). These findings suggest that certain nonalcoholic components that vary among these alcoholic beverages play an important role in urate metabolism. Ingested purines in beer, such as highly absorbable guanosine (23, 47), may produce an effect on blood uric acid levels that is sufficient to augment the hyperuricemic effect of alcohol itself, thereby producing a greater risk for gout than liquor or wine. Whether other nonalcoholic offending factors exist remains unclear, particularly in regard to beer; instead, protective factors in wine may be mitigating the alcohol effect on the risk for gout (28). Fructose is the only carbohydrate that has been shown to exert a direct effect on uric acid metabolism (23). Fructose phosphorylation in the liver uses ATP, and the accompanying phosphate depletion limits regeneration of ATP from ADP. The subsequent catabolism of AMP serves as a substrate for uric acid formation (48). Thus, within minutes after fructose infusion, plasma (and later urinary) uric acid concentrations are increased (42). In conjunction with purine nucleotide depletion, rates of purine synthesis de novo are accelerated, thus potentiating uric acid production (43). Oral fructose may also increase blood uric acid levels, especially in patients with hyperuricemia (49) or a history of gout (50). Fructose has also been implicated in the risk for the insulin resistance syndrome and obesity, which are closely associated with gout (51, 52). Furthermore, hyperuricemia resulting from ATP degradation can occur in acute, severe illnesses, such as the adult respiratory distress syndrome, myocardial infarction, or status epilepticus (34-36). Increased adiposity and the insulin resistance syndrome are both associated with hyperuricemia (53-56). Body mass index, waist-to-hip ratio, and weight gain have all been associated with the risk for incident gout in men (28, 57). Conversely, small, open-label interventional studies showed that weight reduction was associated with a decline in urate levels and risk for gout (58, 59). Reduced de novo purine synthesis was observed in patients after weight loss, resulting in decreased serum urate levels (60). Exogenous insulin can reduce the renal excretion of urate in both healthy and hypertensive persons (54, 61, 62). Insulin may enhance renal urate reabsorption through stimulation of the urate-anion exchanger urate transporter-1 (URAT1) (see Glossary) (63) or through the sodium-dependent anion cotransporter in brush-border membranes of the renal proximal tubule (discussed later in this review). Because serum levels of leptin (see Glossary) and urate tend to increase together (64, 65), some investigators have also suggested that leptin may affect renal reabsorption. Finally, in the insulin resistance syndrome, impaired oxidative phosphorylation may increase systemic adenosine (see Glossary) concentrations by increasing the intracellular levels of coenzyme A esters of long-chain fatty acids. Increased adenosine, in turn, can result in renal retention of sodium, urate, and water (66-69). Some researchers have speculated that increased extracellular adenosine concentrations over the long term may also contribute to hyperuricemia by increasing urate production (66). The growing “epidemic” of obesity (70, 71) and the insulin resistance syndrome (72) present a substantial challenge in the prevention and management of gout. Figure 5. Urate production pathways implicated in the pathogenesis of gout. The de novo synthesis starts with 5’-phosphoribosyl 1-pyrophosphate (PRPP), which is produced by addition of a further phosphate group from adenosine triphosphate (ATP) to the modified sugar ribose-5-phosphate. This step is performed by the family of PRPP synthetase (PRS) enzymes. In addition, purine bases derived from tissue nucleic acids are reutilized through the salvage pathway. The enzyme hypoxanthine– guanine phosphoribosyl transferase (HPRT) salvages hypoxanthine to inosine monophosphate (IMP) and guanine to guanosine monophosphate (GMP). Only a small proportion of patients with urate overproduction have the well-characterized inborn errors of metabolism, such as superactivity of PRS and deficiency of HPRT. Furthermore, conditions associated with net ATP degradation lead to the accumulation of adenosine diphosphate (ADP) and adenosine monophosphate (AMP), which can be rapidly degraded to uric acid. These conditions are displayed in left upper corner. Plus sign denotes stimulation, and minus sign denotes inhibition. APRT adenine phosphoribosyl transferase; PNP purine nucleotide phosphorylase. Associations between hypertension and the incidence of gout have been observed (13, 57), but researchers were previously unable to determine whether hypertension was independently associated or if it only served as a marker for associated risk factors, such as dietary factors, obesity, diuretic use, and renal failure. A recent prospective study, however, has confirmed that hypertension is associated with an increased risk for gout independent of these potential confounders (28). Renal urate excretion was found to be inappropriately low relative to glomerular filtration rates in patients with essential hypertension (73, 74). Reduced renal blood flow with increased renal and systemic vascular resistance may also contribute to elevated serum uric acid levels (75). Hyperuricemia in patients with essential hypertension may reflect early nephrosclerosis, thus implying renal morbidity in these patients. Furthermore, studies have suggested that hyperuricemia may be associated with incident hypertension or cardiovascular disorders. The proposed role of urate in the pathogenesis of these disorders has recently been reviewed in the Physiology in Medicine series (12). * Numbers in parentheses are reference numbers. URAT1 = urate transporter-1. Renal urate transport is typically explained by a 4-component model: glomerular filtration, a near-complete reabsorption of filtered urate, subsequent secretion, and postsecretory reabsorption in the remaining proximal tubule (see Glossary) (76, 77). This model evolved from an interpretation of the effects of “uricosuric” and “antiuricosuric” agents; drugs and compounds known to affect serum urate levels are summarized in the Table. The urate secretion step was incorporated into the model to explain the potent antiuricosuric effect of pyrazinamide (91). However, direct inhibition of proximal tubular urate secretion by pyrazinoate, the relevant metabolite, has never been demonstrated. Indeed, pyrazinamide has no effect in animal species that eliminate urate through net secretion (92), and direct effects of the drug on human urate secretion are largely unsubstantiated (91). Rather, studies utilizing renal brush-border membrane vesicles (see Glossary) (93, 94) have shown that pyrazinoate activates the reabsorption of urate through indirect stimulation of apical urate exchange (Figure 5). Similar mechanisms underlie the clinically relevant hyperuricemic effects of lactate (45), ketoacids (95), and nicotinate (96), as shown in the Table. Recent advances in the understanding of the relevant physiology are reviewed in the following sections. Enomoto and colleagues (63) recently identified the molecular target for uricosuric agents (see Glossary), an anion exchanger responsible for the reabsorption of filtered urate by the renal proximal tubule (Table). The authors searched the human genome database for novel gene sequences within the organic anion transporter (OAT) gene family and identified URATl (SLC22A12) (see Glossary), a novel transporter expressed at the apical brush border of the proximal nephron (63). Urate-anion exchange activity similar to that of URAT1 was initially described in brushborder membrane vesicles from urate-reabsorbing species, such as rats and dogs (97-100), and was subsequently confirmed in human kidneys (101). Frog eggs (Xenopus oocytes) injected with URAT1-encoding RNA transport urate and exhibit pharmacologic properties consistent with data from human brush-border membrane vesicles (63, 101). These and other experiments indicate that uricosuric compounds (for example, probenecid, benzbromarone, sulfinpyrazone, and losartan) directly inhibit URATl from the apical side of tubular cells (“air-inhibition” [see Glossary]). Conversely, antiuricosuric substances (for example, pyrazinoate, nicotinate, and lactate) serve as the exchanging anion from inside cells (Figure 6 and Table), thereby stimulating anion exchange and urate reabsorption (“transstimulation” [see Glossary]) (9, 63). In addition to urate, URAT1 has particular affinity for aromatic organic anions, such as nicotinate and pyrazinoate, followed by lactate, β-hydroxybutyrate, acetoacetate, and inorganic anions, such as chloride and nitrate (63). Enomoto and colleagues (63) provided unequivocal genetic proof that URAT1 is crucial for urate homeostasis: A handful of patients with “familial renal hypouricemia” (OMIM [Online Mendelian Inheritance in Man] accession number 220150; see Glossary) were shown to carry loss-of-function mutations in the human SLC22A12 gene encoding URAT1, indicating that this exchanger is essential for proximal tubular reabsorption. Furthermore, pyrazinamide, benzbromarone, and probenecid failed to affect urate clearance in patients with homozygous loss-of-function mutations in SLC22A12, indicating that URAT1 is essential for the effect of both uricosuric and antiuricosuric agents (see Glossary) (90). Urate transporter-1 (URAT1) is located in the apical membrane of proximal tubular cells in human kidneys and transports urate from lumen to proximal tubular cells in exchange for anions in order to maintain electrical balance. This exchanger is essential for proximal tubular reabsorption of urate and is targeted by both uricosuric and antiuricosuric agents. Sodium-dependent entry of monovalent anions (such as pyrazinoate, nicotinate, lactate, pyruvate, β-hydroxybutyrate, and acetoacetate), presumptively through the sodium–anion cotransporter, fuels the absorption of luminal urate via the anion exchanger URAT1. Basolateral entry of urate during urate secretion by the proximal tubule is stimulated by sodium-dependent uptake of the divalent anion α-ketoglutarate, leading to urate-α-ketoglutarate exchange via organic anion transporter-1 (OAT1) or organic anion transporter-3 (OAT3). These proteins or similar transporters may facilitate the basolateral influx or efflux of urate. As discussed in the text, although the quantitative role of human urate secretion remains unclear, several molecular candidates have been proposed for the electrogenic urate secretion pathway in apical membrane of proximal tubules, including URAT1, ATP-driven efflux pathway (MRP4), and voltage-driven organic anion transporter-1 (OATV1). FE<sub>u</sub> = renal clearance of urate/glomerular filtration rate. Antiuricosuric agents exert their effect by stimulating renal reabsorption rather than inhibiting tubular secretion (91). The mechanism appears to involve a “priming” of renal urate reabsorption through the sodium-dependent loading of proximal tubular epithelial cells with anions capable of a transstimulation of urate reabsorption (Figure 6). Studies from several laboratories have indicated that a transporter in the proximal tubule brush border mediates sodium-dependent reabsorption of pyrazinoate, nicotinate, lactate, pyruvate, β-hydroxybutyrate, and acetoacetate (102-104), monovalent anions that are also substrates for URAT1 (63). Increased plasma concentrations of these antiuricosuric anions result in their increased glomerular filtration and greater reabsorption by the proximal tubule. The augmented intraepithelial concentrations in turn induce the reabsorption of urate by promoting the URAT1-dependent anion exchange of filtered urate (trans-stimulation) (Figure 6). Urate reabsorption by the proximal tubule thus exhibits a form of secondary sodium dependency, in that sodium-dependent loading of proximal tubular cells stimulates brush-border urate exchange; urate itself is not a substrate for the sodium-anion transporter. The molecular identity of the relevant sodium-dependent anion cotransporter or cotransporters remains unclear; however, a leading candidate gene is SLC5A8 (see Glossary), which encodes a sodium-dependent lactate and butyrate cotransporter (105). Preliminary data indicate that the SLC5A8 protein can also transport both pyrazinoate and nicotinate, potentiating urate transport in Xenopus oocytes that co-express URAT1 (106). Figure 7. Dual effects of pyrazinoate on urate transport. The antiuricosuric mechanism explains the long-standing clinical observation that hyperuricemia is induced by increased β-hydroxybutyrate and acetoacetate levels in diabetic ketoacidosis (95), increased lactic acid levels in alcohol intoxication (45), or increased nicotinate and pyrazinoate levels in niacin and pyrazinamide therapy, respectively (96). Urate retention is also known to be provoked by a reduction in extracellular fluid volume (107) and by excesses of angiotensin II (108, 109), insulin (62, 110), and parathyroid hormone (111); URAT1 and the sodium-dependent anion cotransporter or cotransporters may be targets for these stimuli. A conundrum in the pathophysiology of gout has been how certain anions can exhibit either uricosuric or antiuricosuric properties, depending on the dose administered. Monovalent anions that interact with URAT1 have the dual potential to increase or decrease renal urate excretion (93, 112) because they can both trans-stimulate and cis-inhibit apical urate exchange in the proximal tubule (101). For example, a low concentration of pyrazinoate stimulates urate reabsorption as a consequence of trans-stimulation, whereas a higher concentration reduces urate reabsorption through extracellular cis-inhibition of URAT1 (63, 93, 113) (Figure 7). Dissenting opinions notwithstanding (114), these observations remain consistent with the basic scheme of apical urate transport shown in Figure 6. Biphasic effects on urate excretion (that is, antiuricosuria at low doses and uricosuria at high doses) are particularly well described for salicylate (115). Salicylate cis-inhibits URAT1l (63, 116), explaining the high-dose uricosuric effect; low antiuricosuria reflects a trans-stimulation of URAT1 by intracellular salicylate, which is evidently a substrate for the sodium-pyrazinoate transporter (103). Minimal doses of salicylate-75, 150, and 325 mg daily-were shown to increase serum uric acid levels by 16, 12, and 2 μmol/L, respectively (78). However, the effect on the risk for gout of this salicylate-induced increase in the serum uric acid level has not been determined. At the basolateral membrane of proximal tubular cells, the entry of urate from the surrounding interstitium appears to be driven by sodium-dependent uptake of divalent anions, such as α-ketoglutarate, rather than monovalent carboxylates, such as pyrazinoate and lactate (117, 118) (Figure 6). Candidate proteins for this basolateral urate exchange activity include both OAT1 (119) and OAT3 (120, 121) (see Glossary), each of which function as anion1--dicarboxylate2- exchangers (121-123) at the basolateral membrane of the proximal tubule. These proteins (or similar transporters) conceivably facilitate the basolateral influx or efflux of urate. As mentioned previously, the quantitative role of human urate secretion remains unclear. Nonetheless, several molecular candidates have been proposed for the electrogenie urate secretion pathway across the apical membrane of proximal tubules, including the urate transporter/channel (UAT, also known as galectin-9) (124) and the voltage-driven organic anion transporter-1 (OATV1) (125). The apical ATP-driven anion transporter multidrug resistance protein 4 (MRP4) (see Glossary) has also been shown to mediate urate efflux (126). Figure 8. Putative mechanisms for initiation, perpetuation, and termination of an acute monosodium urate crystal-induced gouty inflammation. Recent advances in the understanding of acute gouty attack are illustrated (left). The attack is primarily neutrophil-dependent and initiated by the capacity of urate crystals to activate complements and to stimulate synovial lining cells and resident inflammatory cells to induce a variety of inflammatory mediators. As depicted (right), self-resolution of acute gout is mediated by several mechanisms, including coating of monosodium urate crystals with proteins and clearance by differentiated macrophages, neutrophil apoptosis, clearance of apoptotic cells, inactivation of inflammatory mediators, and the release of anti-inflammatory mediators. Dots represent humoral inflammatory mediators, including cytokines and chemokines. Apo B = apolipoprotein B; Apo E = apolipoprotein E; C1q, C3a, C3b, C5a, C5b-9 complement membrane attack complex; IL = interleukin; LDL = low-density lipoprotein; LTB4 = leukotriene B4; MCP-1 = monocyte chemoattractant protein-1/CCL2; MIP-1 = macrophage inflammatory protein-1/CCL3; MMP-3 = matrix metalloproteinase-3; NO = nitrous oxide; PAF = platelet-activating factor; PGE2 = prostaglandin E2; PLA2 = phospholipase A2; PPAR-α = peroxisome proliferator-activated receptor-α ligand; PPARγ = peroxisome proliferator-activated receptor-γ ligand; TGF-β = transcription growth factor-β ; TNF-α = tumor necrosis factor- α; S100A8/A9 = myeloid-related protein; sTNFr = soluble tumor necrosis factor receptor. Urate crystals are directly able to initiate, to amplify, and to sustain an intense inflammatory attack because of their ability to stimulate the synthesis and release of humoral and cellular inflammatory mediators (Figure 8). Urate crystals interact with the phagocyte through 2 broad mechanisms. First, they activate the cells through the conventional route as opsonized and phagocytosed particles, eliciting the stereotypical phagocyte response of lysosomal fusion, respiratory burst, and release of inflammatory mediators. The other mechanism involves the particular properties of the urate crystal to interact directly with lipid membranes and proteins through cell membrane perturbation and cross-linking of membrane glycoproteins in the phagocyte. This interaction leads to the activation of several signal transduction pathways, including G proteins, phospholipase C and D, Src tyrosine kinases, the mitogen-activated protein kinases ERK1/ERK2, c-Jun TV-terminal kinase, and p38 mitogen-activated protein kinase (see Glossary) (127-130). These steps are critical for crystal-induced interleukin (IL)-8 (see Glossary) expression in monocytic cells (130-132), which plays a key role in the neutrophil accumulation that is discussed later in this review (133). Cellular kinetic analyses using experimental animal models of gout (134, 135) indicate that monocytes and mast cells participate during the early phase of inflammation, whereas neutrophil infiltrates occur later during inflammation (Figure 8). Phagocytes from noninflamed joints may contain urate crystals (136), and most of these phagocytes are macrophages (137). The state of differentiation of mononuclear phagocytes determines whether the crystals will trigger an inflammatory response. In less differentiated cell lines, synthesis of tumor necrosis factor-α (TNF-α) (see Glossary) and endothelial cell activation occurred after urate crystal phagocytosis, whereas well-differentiated macrophages failed to induce TNF-α synthesis or to activate endothelial cells (137). Similarly, freshly isolated human monocytes lead to a vigorous response by induction of TNF-α, IL-1β, IL-6, IL-8, and cyclooxygenase-2 secretion (see Glossary), whereas human macrophages differentiated in vitro for 7 days failed to secrete cytokines (see Glossary) or to induce endothelial cell activation (138). These findings indicate that monocytes play a central role in stimulating an acute attack of gout, whereas differentiated macrophages play an anti-inflammatory role in terminating an acute attack and preserving the asymptomatic state (Figure 8). Experimental animal models suggest that mast cells are involved in the early phase of crystal-induced inflammation (134), and they also release inflammatory mediators, such as histamine (139), in response to C3a, C5a, and IL-1. The vasodilatation, increased vascular permeability, and pain are also mediated by kinins, complement cleavage peptides, and other vasoactive prostaglandins (see Glossary) (140). Neutrophilic synovitis (see Glossary) is the hallmark of an acute gouty attack (Figure 8). Neutrophilic-endothelial cell interaction leading to neutrophilic influx appears to be an important event in this inflammation and represents a major locus for the pharmacologic effect of colchicine. Neutrophil influx is believed to be promoted by the endothelial-neutrophil adhesion that is triggered by IL-1, TNF-α, and several chemokines (see Glossary), such as IL-8 and neutrophil chemoattractant protein-1 (MCP-1). Neutrophil migration involves neutrophilic-endothelial interaction mediated by cytokine-induced clustering of E-selectin (see Glossary) on endothelial cells. Colchicine interferes with the interactions by altering the number and distribution of selectins on endothelial cells and neutrophils in response to IL-1 or TNF-α (141). Once in the synovial tissue, the neutrophils follow concentration gradients of chemoattractants such as C5a, leukotriene B4 (see Glossary), platelet-activating factor, IL-1, and IL-8 (142). Among these factors, IL-8 and growth-related gene chemokines play a central role in neutrophil invasion in experimental models of acute gout (143-147). For example, IL-8 alone accounts for approximately 90% of the neutrophil chemotactic activity of human monocytes in response to urate crystals (133). Neutralization of IL-8 or its receptor may substantially reduce the IL-8-induced neutrophilic inflammatory process (148) and provide a potential therapeutic target in gout. Several other neutrophil chemotactic factors, including the calcium-binding proteins (calgranulins) S100A8 and S100A9 (see Glossary) (149, 150), have also been shown to be involved in neutrophil migration induced by urate crystals (Figure 8). The self-limited nature of acute gout is thought to involve several mechanisms (151), as shown in Figure 8. Clearance of urate crystals by differentiated macrophages in vitro has been linked to inhibition of leukocyte and endothelial activation (137, 138, 152). Neutrophil apoptosis (see Glossary) and other apoptotic cell clearance represent a fundamental mechanism in the resolution of acute inflammation. Furthermore, transforming growth factor-β (see Glossary) becomes abundant in acute gouty synovial fluid and inhibits IL-I receptor expression and IL-Idriven cellular inflammatory responses (153, 154). Upregulation of IL-IO expression has been shown to limit experimental urate-induced inflammation and may function as a native inhibitor of gouty inflammation (155). Similarly, urate crystals induce peroxisome proliferator-activated receptor-γ (PPAR-γ) (see Glossary) expression in human monocytes and promote neutrophil and macrophage apoptosis (156). Research has yet to determine if the PPAR-γ-based therapy currently available for type 2 diabetes would also be useful in gout management. Inactivation of inflammatory mediators by proteolytic cleavage, cross-desensitization of receptors for chemokines, release of lipoxins (see Glossary), IL-1 receptor antagonist, and other anti-inflammatory mediators all facilitate the resolution of acute gout. As shown in Figure 8, increased vascular permeability allows the entry of large molecules (such as apolipoproteins B and E [see Glossary]) and other plasma proteins into the synovial cavity, which also contributes to the spontaneous resolution of acute flares (157, 158). Chronic gouty arthritis typically develops in patients who have had gout for years (Figure 9). Cytokines, chemokines, proteases, and oxidants involved in acute urate crystal-induced inflammation also contribute to the chronic inflammation, leading to chronic synovitis, cartilage loss, and bone erosion. Even during remissions of acute flares, low-grade synovitis in involved joints may persist with ongoing intra-articular phagocytosis of crystals by leukocytes (136). Tophi on the cartilage surface, which can be observed through arthroscopy (159), may contribute to chondrolysis despite adequate treatment of both hyperuricemia and acute gouty attacks (160). Adherent chondrocytes phagocytize microcrystals and produce active metalloproteinases. Furthermore, crystal-chondrocyte cell membrane interactions can trigger chondrocyte activation, gene expression of IL-1β and inducible nitric oxide synthase, nitric oxide release, and the overexpression of matrix metalloproteinases (see Glossary) that leads to cartilage destruction (161). The crystals can also suppress the 1,25-dihydroxycholecalciferol-induced activity of alkaline phosphatase and osteocalcin (see Glossary). Thus, crystals can reduce the anabolic effects of osteoblasts, thereby contributing to damage to the juxta-articular bone (162) (Figure 9). Figure 9. Putative mechanisms for chronic monosodium urate-induced inflammation and cartilage and bone destruction. Low-level inflammation persists during the remissions of acute flares. Cytokines, chemokines, proteases, and oxidants involved in acute inflammation contribute to chronic inflammation leading to chronic synovitis, cartilage loss, and bone erosion. Monosodium urate (MSU) crystals are able to activate chondrocytes to release interleukin-1, inducible nitric oxide synthetase, and matrix metalloproteinases, leading to cartilage destruction. Similarly, MSU crystal activation of osteoblasts, release of cytokines by activated osteoblast, and decreased anabolic function contribute to the juxta-articular bone damage seen in chronic MSU inflammation. IL = interleukin; iNOs = inducible nitrous oxide synthase; MMP-9 = matrix metalloproteinase-9; PGE2 = prostaglandin E2. The disease burden of gout remains substantial and may be increasing. As more scientific data on modifiable risk factors and comorbidities of gout become available, integration of these data into gout care strategy may become essential, similar to the current care strategies for hypertension (163) and type 2 diabetes (164). Recommendations for lifestyle modification to treat or to prevent gout are generally in line with those for the prevention or treatment of other major chronic disorders (32). Thus, the net health benefits from these general healthy lifestyle recommendations (32) are expected to be even larger among many patients with gout, particularly those with coexisting insulin resistance syndrome, diabetes, obesity, and hypertension. Weight control, limits on red meat consumption, and daily exercise are important foundations of lifestyle modification recommendations for patients with gout or hyperuricemia and parallel recommendations related to prevention of coronary heart disease, diabetes, and certain types of cancer. Patients with gout could consider using plant-derived ω-3 fatty acids or supplements of eicosapentaenoic acid and docosahexanoic acid instead of consuming fish for cardiovascular benefits. The recent recommendation on dairy consumption for the general public would also be applicable for most patients with gout or hyperuricemia and may offer added benefit to individuals with hypertension, diabetes, and cardiovascular disorders. Further risk-benefit assessments in each specific clinical context would be helpful. Daily consumption of nuts and legumes as recommended by the Harvard Healthy Eating Pyramid (32) may also provide important health benefits without increasing the risk for gout. Similarly, a daily glass of wine may benefit health without imposing an elevated risk for gout, especially in contrast to beer or liquor consumption. These lifestyle modifications are inexpensive and safe and, when combined with drug therapy, may result in better control of gout. Effective management of gout risk factors (for example, hypertension) and the strategic choice of certain therapies for comorbid conditions may also aid gout care. For example, antihypertensive agents with uricosuric properties (for example, losartan  or amlodipine ) could have a better risk-benefit ratio than diuretics for hypertension in hypertensive patients with gout. Similarly, the uricosuric property of fenofibrate (165) may be associated with a favorable risk-benefit ratio among patients with gout and the metabolic syndrome. The recently elucidated molecular mechanism of renal urate transport has several important implications in conditions that are associated with high urate levels. In particular, the molecular characterization of the URAT1 anion exchanger has provided a specific target of action for well-known substances affecting urate levels. Genetic variation in these renal transporters or upstream regulatory factors may explain the genetic tendency to develop conditions associated with high urate levels and a patient’s particular response to medications. Furthermore, the transporters themselves may serve as targets for future drug development. Finally, advances in our understanding of crystal-induced inflammation indicate that gout shares many pathogenetic features with other chronic inflammatory disorders. Some newly available potent anti-inflammatory medications (including biological agents that are indicated for other conditions) may have therapeutic potential in selected subsets of patients with gout, although the high costs of biological agents would probably prevent their widespread use in gout. Anti-inflammatory agents for gout (including colchicine) are typically used to treat acute gout or to reduce the risk for rebound gout attacks during the initiation of urate-lowering therapy but do not lower serum levels of uric acid. The long-term safety profile of these agents needs to be clarified, including the potential consequences of chronic hyperuricemia with such anti-inflammatory treatment. 1. Terkeltaub RA. Clinical practice. Gout. N Engl J Med. 2003;349:1647-55. [PMID: 14573737]. 20. Hochberg MC, Silman AJ, Smolen JS, Weinblatt ME, Weisman M. Rheumatology. 3rd ed. New York: Mosby; 2003. 25. Clifford AJ, Riumallo JA, Young VR, Scrimshaw NS. Effects of oral purines on serum and urinary uric acid of normal, hyperuricaemic and gouty humans [Abstract]. J Nutr. 1976;106:428-50. 33. Klippel JH. Primer on the Rheumatic Diseases. 12th ed. Atlanta, GA: Arthritis Foundation; 2001. 34. Koopman WJ. Arthritis & Allied Conditions: A Textbook of Rheumatology. 12th ed. New York: Lippincott Williams & Wilkins; 2001. 73. Wyngaarden JB, Kelley WN. Gout and Hyperuricemia. New York: Grune & Stratton; 1976. 77. Giebisch G, Windhager E. Transport of urea, glucose, phosphate, calcium, magnesium, and organic solutes. In: Boron W, Boulpaep E, eds. Medical Physiology. Philadelphia: WB Saunders; 2003:790-813. 82. Gupta AK, Rocher LL, Schmaltz SP, Goldfarb MT, Brown MD, Ellis CN, et al. Short-term changes in renal function, blood pressure, and electrolyte levels in patients receiving cyclosporine for dermatologic disorders. Arch Intern Med. 1991;151:356-62. [PMID: 1992963]. 106. Zandi-Nejad K, Plata C, Enck AH, Mercado A, Romero MF, Mount DB. Slc5a8 functions as a sodium-dependent pyrazinoate and nicotinate cotransporter; implications for renal urate transport. J Am Soc Nephrol. 2004;15:89A. 164. Kasper DL, Braunwald E, Fauci AS, Hauser SL, Longo DL, Jameson JL. Harrison’s Principles of Internal Medicine. 16th ed. New York: McGraw-Hill; 2004. Do you have suggestions for improving Development Of Gout? Then, please add your idea to GoutPal’s Suggestion Box. Or, send the Feedback Form, below.